What is the Lifespan of the House Spider? Canada is generally known as a cold-weather country, but its southernmost regions, where most of its people live, experience plenty of warm weather in the middle of the year. This allows plenty of insects and other creepy-crawly animals, including spiders, to thrive. The Ottawa Valley area of Canada, which runs roughly along the Ontario-Quebec border midway between Toronto and Montreal (the country's two largest cities), is home to variety of spiders, most of which are widespread throughout the rest of the North American continent. Despite the presence of the wolf spider, the black widow spider and the recluse spider, Canada is not known for an intimidating array of large or venomous arachnids. There are few dangerously poisonous spiders in Canada, Ontario and Quebec included. Also called the fiddleback spider, the brown recluse spider is one of North America's most notorious arachnids. This spider lays most of its eggs between May and August. It is a small spider compared to its reputation: The brown recluse size range is about one-fourth of an inch to one-half of inch. As the name implies, these spiders are brown. The outstanding feature of the recluse spider is its often-painless but damaging bite. 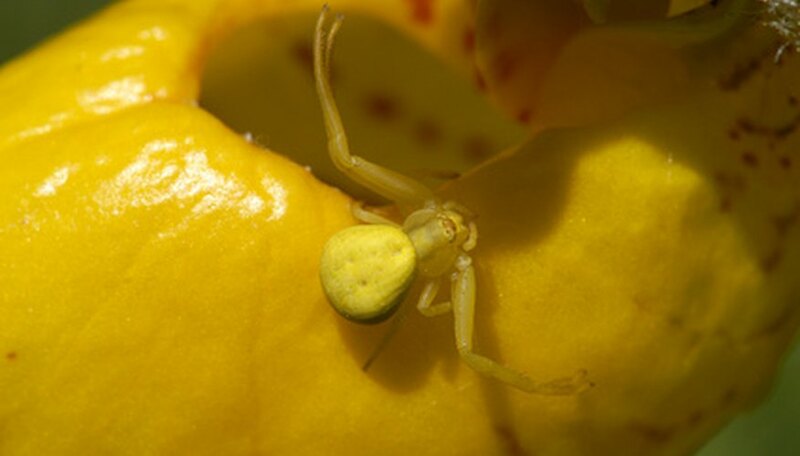 The venom usually causes tissues near the site to actually die, a process called necrosis. An ulcer may form and not begin to heal for two weeks, and full resolution often takes six to eight weeks. Wolf spiders are extraordinary among spiders because they do not build webs to catch food. Rather, they roam about and hunt for their prey. Wolf spiders can be over an inch long, big for a spider, and are dark brown in color. They live on the ground in grasslands, woodlands and gardens. They feed predominantly on insects. In autumn, they start to seek warm places, so they are more likely to enter Ottawa Valley homes at that time. Wolf spiders bite, but only when they are threatened. Their venom can cause very mild redness and swelling. The house and black widow spider belong to the same taxonomic family. The house spider is more commonly spotted inside residential buildings, while the black widow spider is likely to be seen in man-made structures people do not live in, such as crawl spaces, garages or outhouses. The house spider's color ranges from off white to nearly black, with visible markings. Its first pair of legs is almost three times the length of its whole body. It builds webs in dark corners, under furniture, and anywhere insects might be caught. The black widow spider is a shiny black, with a distinctive red "hourglass" mark on its underbelly. It is not aggressive and would rather flee than fight, so it will only bite to defend itself. Be careful when working near spider webs in secluded locales, and wear heavy gloves. Beck, Kevin. "Types of Spiders in Ottawa Valley." Sciencing, https://sciencing.com/types-spiders-ottawa-valley-7795023.html. 03 August 2018.